Infectors are a simple and intuitive too that can be used to set ''initial conditions'' when you want to start a simulation with a specific number or percentage of people in the ''infectious state''. 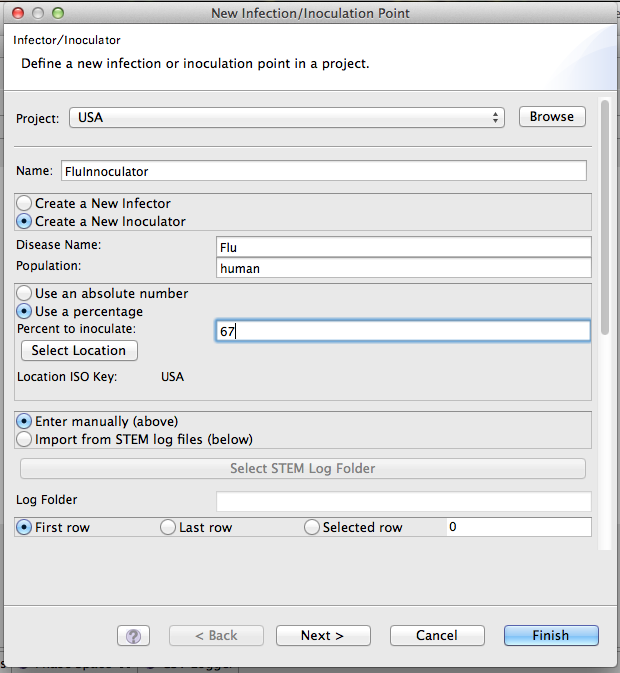 Please see '''[http://wiki.eclipse.org/Creating_a_STEM_Scenario#Create_an_Infector Creating a STEM Scenario]''' to see an example of how infectors are used. The infector, at simulation start, takes the specified number from the Susceptible state and moves them to the infectious state. You can configure an inoculator to set the initial condition for a specific regions, at node containing sub-regions (e.g., a state or country) or your entire graph. The wizard for creating an infector is shown to the right. Infectors also allow a user to initialize the disease state from an external file (or a previous set of run files). This is useful when you want to specify specific values for many individual locations (as opposed to the same percentage everywhere). Disease initializers (see below) provide an even more powerful way to specify the initial state for every compartment in one step. Infectors are a simple and intuitive too that can be used to set ''initial conditions'' when you want to start a simulation with a specific number or percentage of people in the ''infectious state''. 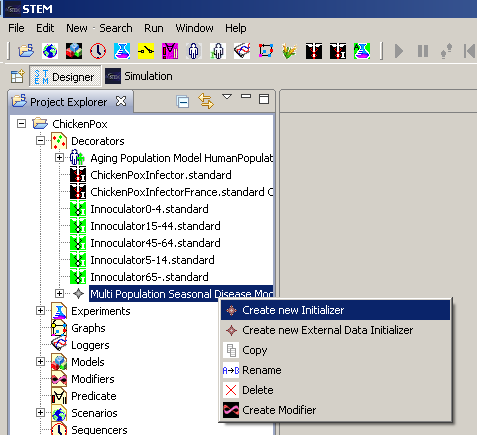 Please see '''[http://wiki.eclipse.org/Creating_a_STEM_Scenario#Create_an_Infector Creating a STEM Scenario]''' to see a step by step example of how infectors can be used. The infector, at simulation start, takes the specified number from the Susceptible state and moves them to the infectious state. You can configure an inoculator to set the initial condition for a specific regions, at node containing sub-regions (e.g., a state or country) or your entire graph. The wizard for creating an infector is shown to the right. Infectors also allow a user to initialize the disease state from an external file (or a previous set of run files). This is useful when you want to specify specific values for many individual locations (as opposed to the same percentage everywhere). Disease initializers (see below) provide an even more powerful way to specify the initial state for every compartment in one step. Infectors are a simple and intuitive too that can be used to set initial conditions when you want to start a simulation with a specific number or percentage of people in the infectious state. Please see Creating a STEM Scenario to see a step by step example of how infectors can be used. The infector, at simulation start, takes the specified number from the Susceptible state and moves them to the infectious state. You can configure an inoculator to set the initial condition for a specific regions, at node containing sub-regions (e.g., a state or country) or your entire graph. The wizard for creating an infector is shown to the right. Infectors also allow a user to initialize the disease state from an external file (or a previous set of run files). This is useful when you want to specify specific values for many individual locations (as opposed to the same percentage everywhere). Disease initializers (see below) provide an even more powerful way to specify the initial state for every compartment in one step. Inoculators are very similar to infectors. They are used to set the initial condition or initial state of a population when a user wants to set the herd immunity at simulation start. They work by moving a specified number or percentage of people from Susceptible to Recovered. Like infectors you can configure an inoculator to set the initial condition for a specific regions, at node containing sub-regions (e.g., a state or country) or your entire graph. The wizard for creating an inoculator is the same as the wizard for creating an infector (shown to the right). Inoculators also allow a user to initialize the disease state from an external file (or a previous set of run files). This is useful when you want to specify specific values for many individual locations (as opposed to the same percentage everywhere). Inoculators also allow a user to initialize the disease state from an external file (or a previous set of run files). This is useful when you want to specify specific values for many individual locations (as opposed to the same percentage everywhere). 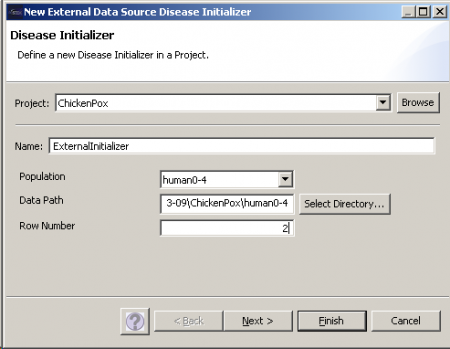 Disease Initializers are a much more flexible and powerful way to set initial conditions. Users can specify and set or target compartments to initialize so a Disease Initializer can play the role of Infector, Inoculator, and more. For example one can also set the initial number of Exposed people in an SEIR model. 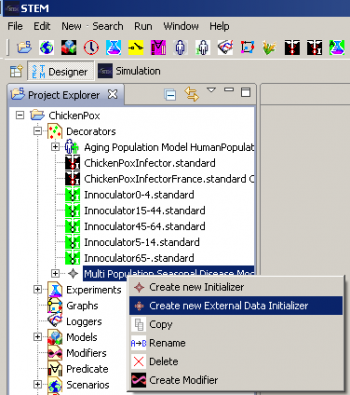 To create an initializer for a specific disease, the user has to right click on the disease and select "Create new Initializer".